Interesting that Claremont moves to the single hero issues from time to time. I dig them, this one especially. There’s something about reading a team book, but never really understanding the characters individually, only in response to others. Refreshing to say the least. 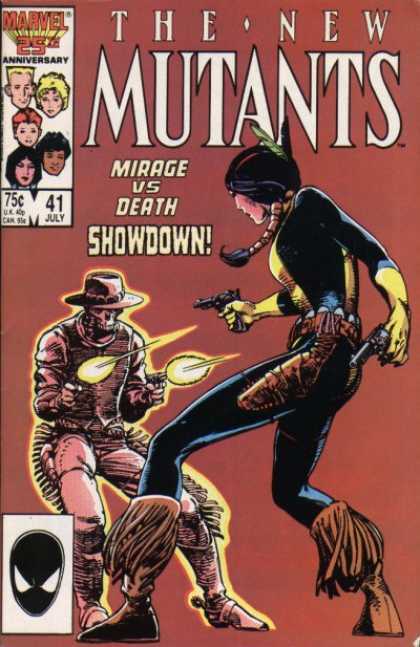 No plane across country for our girl Mirage as she returns home after leaving the New Mutants. Nossir, she’ll take the flying horse, running headlong into a snowstorm. She’s obviously not thinking clearly, but we’ll forgive her for that: not only taking into account the aftermath of all the happy-crappy with the Beyonder, she’s not seen her parents in ages, and their relationship seems rocky at best. Plus: there’s something of an ex in the picture. What she is seeing are a bunch of her manifested emotions. She’s normally got her powers under control, but with all the stress lately, she’s bound to slip up. What she needs is some time with the horse, a nice hot shower, and a warm bed. And maybe some new clothes at the mall. There she meets the aforementioned ex, and has to deal with his jerk attitude towards her. This, fortunately, has less to do wither her race than it does what she did to him as a kid. We don’t hear much of it, but she used her mutant powers against him before she knew what she was doing. No bueno. This sets the rest of the story up for a hankering to be a hero. Not only is he a scorned lover (who still loves amid all that hate) but he’s got drinking and diabetic problems. It’s up to Mirage to be the who she needs to be, Cheyenne and Valkyrie, to stare death down in the snow.